The discipline of sociology has grappled with several overlapping issues regarding the purpose and utility of our profession beyond its intellectual pursuit. Debates about the social impact of sociology have been historically centred on three questions relevant to applied sociology – which I define here as sociology conducted outside universities for particular clients. These questions are: sociology for what? ; sociology for whom? ; and sociology for where? In today’s post, I will discuss the who, what and where of sociology, before introducing a fourth question that is so taken-for-granted we don’t spend much time talking about it in any concrete way. That is: how do we actually do sociology outside traditional academic research? We assume sociologists can go out into the world and apply their training to different problems. But what kind of problems do we work on and how do we actually carry out the work in different places? I argue that applied sociology is set up as the “other” of academic sociology because of the context in which we practice our craft. This stops sociologists from engaging with one another effectively, and hinders the transformational work we do separately with our respective audiences. I seek to build upon the framework discussed in this post for a series exploring the practicalities of doing sociology outside academia. I hope that the ideas explored here and in future posts can open up dialogue about how to better address collaboration between academic and applied sociologists. Robert Lynd posed the question “knowledge for what?” in 1939, teasing out the tensions about carrying out research that might be reappropriated by funding bodies to suit their vested interests. Sociologists study culture – but they are also the outcome of culture, as well as contributors to it. They are also constrained by the culture of the groups who fund their research. Lynd focused on American culture at a time where he felt that social scientists had to take a stand against particular institutions. Lynd argued we should only carry out research about topics that matched social science values. Sociology has evolved from this idealist position, although sociological principles still steer researchers towards some topics and institutional causes over others. This question remains relevant to applied sociologists, as it demands that we ask: who benefits from sociological practice and how will our knowledge be used in “the real world”? Photo by Adam Jones via Flickr. Text by The Other Sociologist. Alfred McClung Lee posed the question “sociology for whom?” in his 1976 Presidential Address to the American Sociological Association. This question has plagued sociology since its inception: why do we do sociology? Do we do it for other sociologists? If so, research and academic publishing are the main outcomes of our discipline. Do we do it for a broader public? If so, then how do we support the activities of sociologists who practice outside universities? In the late 1990s, Anne Mensy argued that sociologists don’t see policy-makers as the primary consumers of sociological knowledge. This hampers the ability for sociologists to take control of how a “sociological consciousness” might be diffused to the broader public. Mensy sees that sociology is for everybody; it is not simply an academic art. It should shape what currently passes for “common sense,” ultimately replacing it with a reflexive approach to how individuals understand their responsibility to other people. In 2004, Michael Burawoy addressed the same question by talking about the four audiences that sociology addresses. Two of these are academic audiences. Professional sociology is concerned about theory and empiricism. Critical sociology addresses our discipline’s ideals, morality and our internal debates. The other two audiences are non-academic. Policy sociology addresses clients and policy intervention. Public sociology speaks to broader society at the grassroots level as well as through public intellectualism. This includes widely-distributed books and mass media. a re-vitalised sociological imagination can and does have all kinds of impacts – it can be neglected, misunderstood and redefined for all kinds of interests. When public or other kinds of sociology become an integral part of practical and political discourses, they are effectively being ‘transformed’, that is, divested of their sociological identity, and constructed ‘anew’ in the interests and for the purposes of practical argumentation and acting. Applied sociologists take charge of translating sociology into new contexts by virtue of the fact that they work in non-academic contexts. So where and how do we meet up with our academic colleagues in order to take up the challenge of transforming sociology in a more cohesive and mutually supportive manner? Thinking about how place influences sociological analysis is central to the work of applied sociologists. 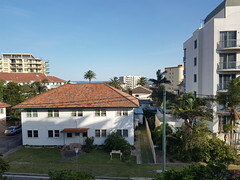 Place can mean geography – where the research is being conducted. It can also speak to the social location (or status) of the researcher and their participants or clients in relation to the place where a project is undertaken. Australian sociologist Barbara Pini illuminates the “sociology of where?”question beautifully by reflecting on her position as a young female PhD student interviewing male leaders of a rural Queensland agricultural organisation. Her participants were keen to emphasise their masculinity and heterosexuality as a point of superiority. Their discussion was focused on themselves as powerful, busy experts. Their language and tone was used to repeatedly undermine Pini’s scientific authority and her ability to represent their experiences given her status as a woman. Pini’s male supervisor attended some meetings with these agricultural leaders and he was not subjected to the same disrespect. Pini notes that her sociological training had not really prepared her to manage such experiences. Feminism has made power relationships in research more visible. Feminists politicise the notion that the bodies of researchers and their participants communicate knowledge and power relations. Related issues are discussed through the concepts of the “embodied knower” and “situated knowledge.” Pini is now a fully-fledged academic (well and truly, she’s a Professor of sociology). This means her research does not meet my working definition of applied sociology. Nevertheless, her research brings focus on the personal costs of doing sociology in places where the embodied knowledge of sociologists is met with open hostility and aggression. Pini argues that sociology should be concerned with addressing sociological questions from several perspectives: “Who is asking whom about what and where?” So – how do we address these questions in a non-academic context? How to apply sociology outside academia? Applied sociologists do not always engage in research as a primary activity. 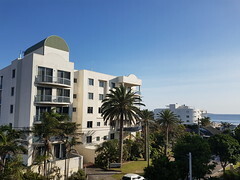 They manage case work; they are involved in mediation; they work for unions; they manage local community projects; they work with not-for-profit groups; they are involved in policy and decision-making – amongst other things. Applied sociologists collaborate with activists and practitioners from other disciplines, and they work collaboratively with communities. The work we do does not always resemble the type of sociology privileged by the academy. Applied sociologists are often constrained in their ability to attend conferences and publish in academic journals. This means our work is less notable to our academic colleagues. Who is doing sociology with whom? About what? How and where? Sociology has long addressed issues of race, class gender and sexuality. It speaks about minority and disadvantaged groups, but not always engaging them in ways that acknowledges the intersections of oppression. Black feminists and “Third World” sociologists pose the question: who should study inequality and how should it be studied in different contexts? How do sociologists collaborate with physicians? How does medical sociology address different health and illness problems in different local, national and international settings? How do we measure whether sociological knowledge has benefit to different kinds of patients? How does sociology inform disaster planning? Do women understand natural disasters differently than men? Research suggests that they do, so how should gender relations shape disaster planning? How is a gendered disaster framework delivered to publics that aren’t used to thinking about gender or disaster in sociological ways? How do we better connect policy makers with the issues that are most important to youth? Plenty of research is conducted about children. Some of it involves children as research participants – but how does sociology facilitate kids to lead research about other kids? Can all children be transitioned into the role of researcher? Supporting the involvement of young researchers is difficult in practical ways that aren’t really discussed in the academic literature. It comes down to the political curiosity of different groups of youth, the types of questions being asked and even the way in which the physical research environment is set up (for example how tables and chairs are positioned). There seems to be less of a focus on the temporal dimension of sociological practice. We don’t explicitly ask “sociology for when?”, although I’ve previously discussed that the sociology of time is a useful way to think about culture. Different groups have different understandings of time, and these ideas of time have given rise to different social relations. For now, it’s sufficed to say that social definitions of time in different parts of the world have an effect on the ways that applied sociologists work. I will take up this point much later in this blog series. Another issue related to “how” and “where” of applied sociology relates to what happens in our absence in the industries and places that our discipline considers unsavoury, unworthy of our sociological attention, or otherwise problematic. Those of us who go to work outside universities are met with a great deal of criticism from our colleagues. The differences between academic and applied work contexts are very real, however, the ideological divisions between different sociological practices are artificial, unnecessary and fundamentally doing our discipline a disservice. I’ve previously noted that the lines between applied and academic practices are sometimes blurred as many academics will work in policy areas or undertake contract work for clients. Researchers might start off working in universities, then work as consultants for a time, and then return to academia. Nevertheless, the what/whom/where/how questions facing academics who do research on applied topics have different connotations than the questions and issues facing sociologists who work in non-academic organisations. Notably, the collision between the “where” and “how” questions means that expertise of applied sociologists are not conferred the same institutional authority as universities do for academic sociologists. 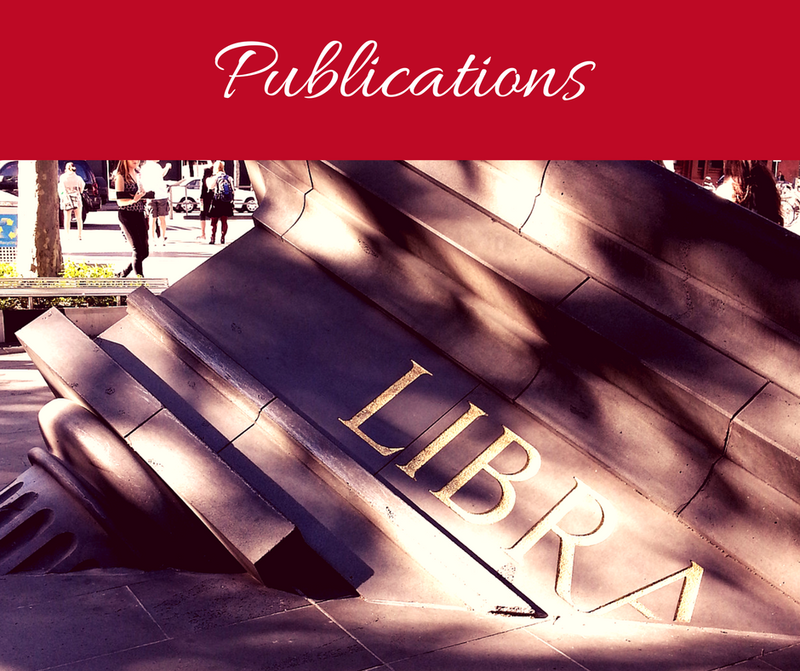 In 2007, I founded the Applied Sociology Group within The Australian Sociological Association (TASA) to address the professional issues and concerns of non-academic sociologists. 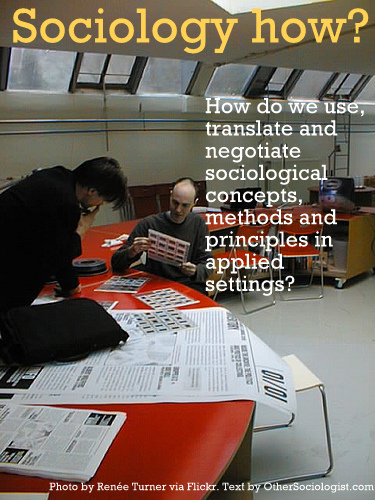 In 2009, a small group of colleagues and I set up Sociology at Work (S@W) to extend this network internationally. (We did so with the financial support of TASA.) S@W aims to support the career planning of sociology graduates and to promote the research and activities of applied sociologists. Through these groups, I have found that many applied sociologists will privately talk with one another about the confusion, derision and criticism we encounter from former academic colleagues about the work we do. Sometimes applied sociologists feel frustrated by our discipline’s focus on being “too academic” (defined as being overly focused on jargon and abstract ideas). Then again some applied researchers find ways to accommodate academic practices in their daily work. Nevertheless, more often than not, applied sociologists are looked down upon by their former academic colleagues for doing work that is judged to be inferior. By leaving the academy, we may enter organisations that make many academic sociologists uncomfortable either because of a moral objection to particular institutions or because the work seems to dilute sociological principles. This might relate to certain areas of government (“sociology for what?”), law enforcement (“sociology for whom?”), and commercial market research (“sociology for where?”). For a long while, I have been arguing that applied sociology is set up as the “other” of academic work. When I left academia as an early career researcher, I specialised in ethnicity and migrant issues. After struggling to find stable, long-term work in academia, I went to work in government conducting analysis on counter-terrorism issues, national security and social cohesion. 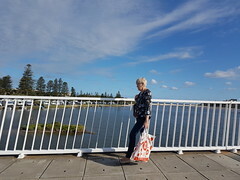 In doing so, I was met with a range of emotional responses by my academic colleagues and mentors related to the “sociology for what?” Some people were bemused and curious, but most were highly sceptical of what the motives could be for hiring a sociologist in the defence and national security space. Other sociologists were incredulous that I could maintain my ethical compass amidst the moral decay that they see as the undercurrent of all government work. In 2007, I noted that Peter Berger once drew a comparison between sociologists who work for governments and ‘An alchemist locked up by a predatory prince who needs gold and needs it quickly…’ In the same article, I argued that this portrait of government work as nefarious explains the general reticence that sociologists have about national security research. I noted then that only a few Australian academics had publicly supported applied sociological work in this space. Little has changed since. In 2010, I reflected about my adventures outside academia, focusing on the fact that my sociological training did not prepare me for how to manage my career beyond university walls. After five years, I left my job with the Australian Public Service. I would later go on to work on a large-scale investigation. We analysed how chemicals and practices used during training exercises may have led to adverse health and environmental outcomes amongst emergency service volunteers in rural Victoria in Australia. I will reflect further on my professional lessons in the near future. Today I want to draw a connection between the “otherness” of applied sociology and how it fits in with the broader questions of what, who, where and how of sociological practice. The art that I find so beguiling – developing policy iteratively, moulded by an environment of political contest and organisational advocacy, responsive to unexpected opportunity, stymied by unforeseen barriers and shaped by financial exigency – is an uncomfortable discipline for the purist. In the context of the insights that Bourdieu (1998; 2003), Shergold (2005), Saunders and Walter (2005) put forward, sociologists need to ask themselves: are we prepared to engage in practical policy processes that affects peoples’ lives while knowing that such processes will be imperfect? Are we prepared to put forward anything other than deconstruction? Are we able to accept the second-best outcome as Shergold asks? And can we work with policy development processes that are not going to be fully open and participative certainly not formally and certainly not in the short term? The sociology for what, who, where and how questions have relevance not just for our respective academic and client audiences, but also within our discipline. How do we communicate effectively with outsiders if a significant proportion among us is not adequately engaged with the other? How do we permeate public consciousness and challenge power structures, as Mensy and Burawoy advocate, if we don’t cooperate more directly with policy makers and institutions (including the ones that may not don’t fit in with social science values)? Sociologists continue to grapple with the question of how to do sociology for people who are not sociologists, given that our discipline is primarily situated as an academic field. I’ve discussed the issues facing sociological practices in relation to four questions. First, sociology for what? 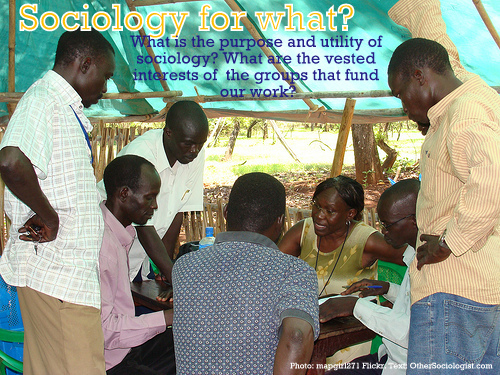 This refers to the purpose and utility of sociology and the vested interest of groups that fund our work. Second, sociology for whom? This speaks to the different audiences and users of academic and applied sociological practices. Third, sociology for where? refers to the geographic and social location of the practitioner and their participants or clients. This question encompasses issues of embodied status and power. 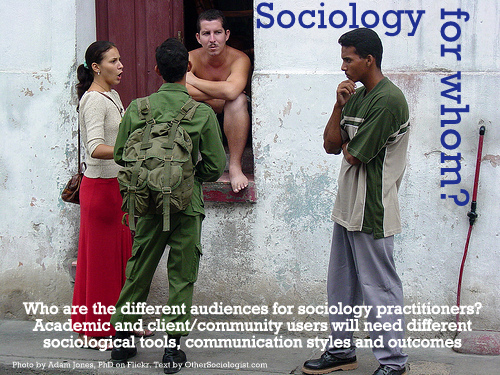 Finally, how do we practice sociology for particular groups in specific settings? This refers to clear, concrete examples which outline the process of applying theories, concepts, methods and principles in specific work contexts. Sociological ideas are sometimes taken up by non-sociologists, but sociology has struggled to take control of how our methods and concepts are used in other fields. One way to address this is by becoming more aware of the who, what, where and how of different sociological practices. Another way to address this is by reducing the otherness of applied sociologists. Applied sociologists signify a bridge in between academic and public audiences. Our discipline might better off reconciling different sociological practices to better understand the nuts and bolts of social and institutional change. This involves work on both sides. Academia can decrease the stigma attached to applied sociologists by having more empathy and respect for the reality of how applied sociologists work. This means listening and becoming educated about practitioners who inhabit different sociological spaces, rather than dismissing entire industries as a waste of sociological training. 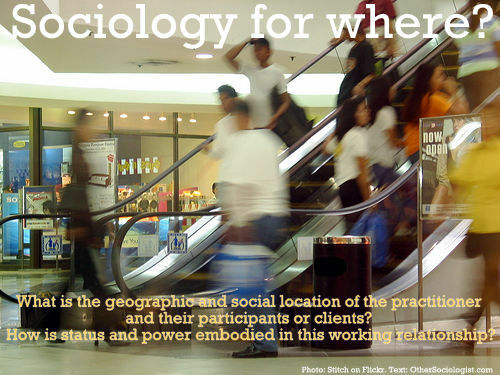 Applied sociologists need to find ways of sharing the what, who, where and how they practice sociology. 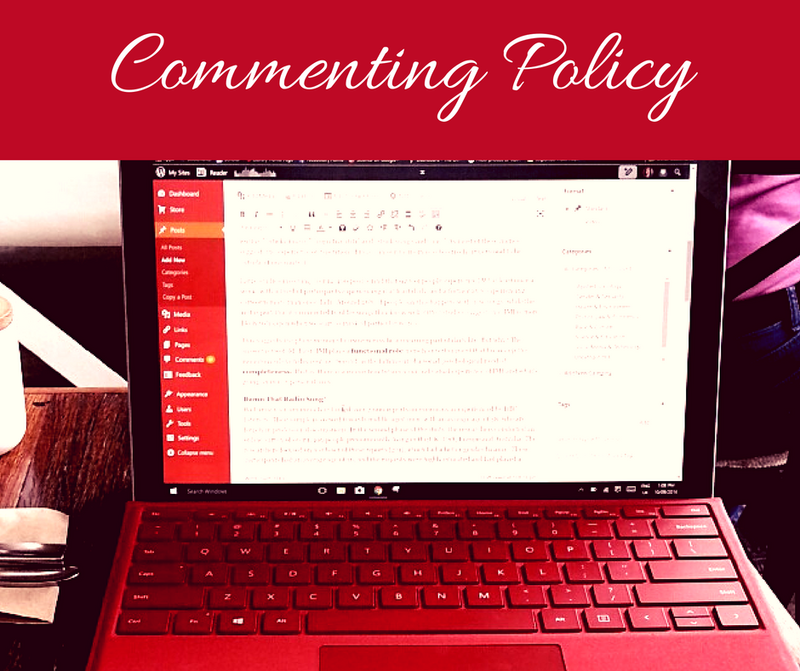 Time and resources may exclude us from some modes of intra-disciplinary communication, such as face-to-face conferences and academic publishing, but it doesn’t exclude all opportunities to share our experiences. Academic and applied sociologists can decrease their distance by finding new ways of collaborating towards public sociology, so that together, we lift the public profile of our discipline. Sociology needs to find innovative ways to feed the experiences of practitioners back to our academic colleagues. This might involve collaborating on projects or finding new platforms to share our work, including online, given that funding and timing prevents some of us from meeting face-to-face. Perhaps this means brining in more applied researchers into sociology classrooms to demonstrate how learning meets practice. I want to take this up in a later post on how to bridge the divide between academic and applied sociologies. Speaking as a fellow applied sociologist, this is great stuff. Thanks for posting. First of all i appreciate your work on social science and this article is very good specially i like this article because of i am social science student. What you said in your article is based on reality but the problem is now in today’s world some powerful and rich peoples control the west and they have full control on media,internet,print media,politics,military,economy etc and the people don’t think what is our goal of life why we are created just for enjoyment infact the new generation don’t know how the devil powers control thier mind with the resources of media,internet,pint media.The east and west media don’t show the international affairs,reality of west and east puupets,who control the world economy etc. Hello Professor Dominic Kofi Agyeman, thanks for your kind words. I’m pleased that my articles have resonated with you. Your book sounds very useful. 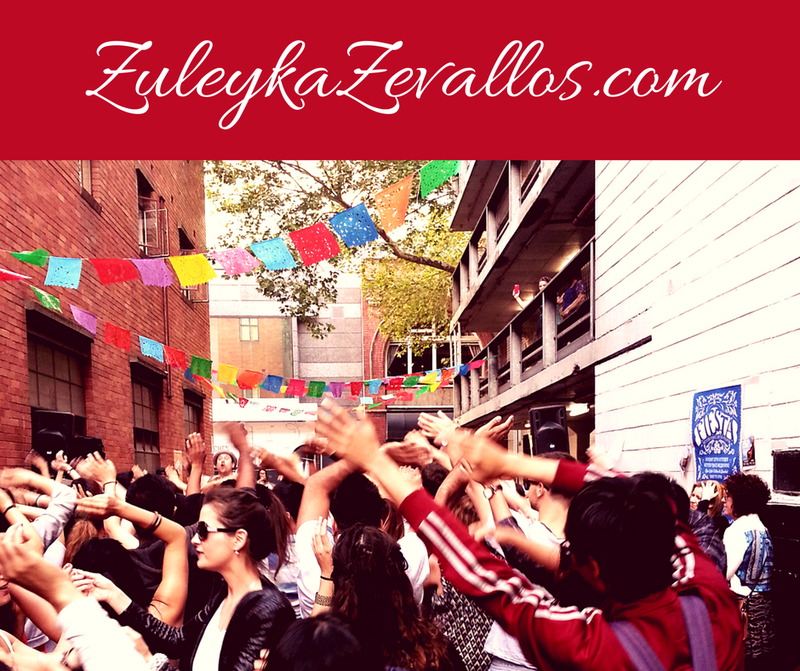 You can follow my writing by signing up to my blog. If you look at my website, on the right hand side, there’s a section second from the top: “FOLLOW THE OTHER SOCIOLOGIST VIA EMAIL.” If you add your email there, you’ll get updates on my writing direct to your email. Best of luck with you writing!